Murder suspect Joshua Lelevier was back on the witness stand today in his trial on charges of killing his stepdaughter. Because Lelevier’s attorneys put him on the stand last week, he was also vulnerable to questions from prosecutors and from the jury. Today he answered questions the jurors wrote down for the judge to read to Lelevier but those questions also gave prosecutors a chance to try to knock holes into Lelevier’s defense. Several of the jury questions related to the two surveillance cameras Lelevier planted in Jayden Glomb’s bathroom. Before she died, the girl told a friend she had already seen her stepfather try to take a picture by sliding a phone under the door and that she had been terrified ever since. Lelevier insists the camera were only a misguided effort to catch the 13 year old drinking alcohol and to gather evidence to convince the girl’s mother. But with Lelevier on the stand, Prosecutor Jonathan Mosher reminded him how jurors asked what would he expect if he rigged cameras to see into a girl’s bathroom. 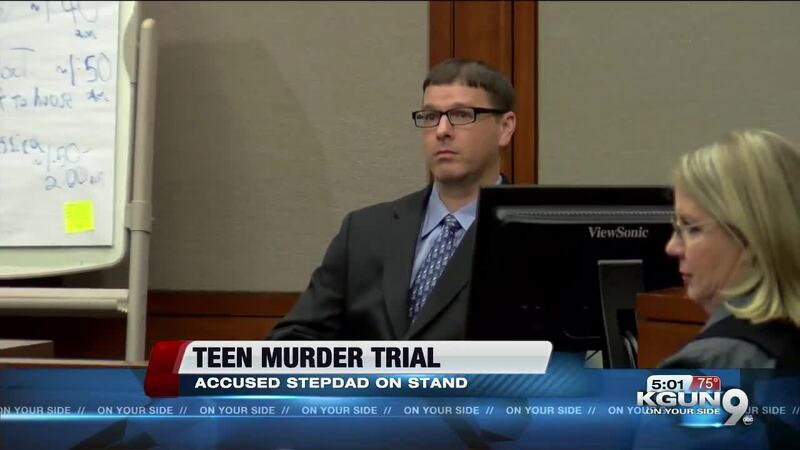 Lelevier claimed he thought his stepdaughter dressed in her bedroom, not her bathroom. Lelevier claimed many of the images were captured by accident because he did not really understand how to use the cameras and their software but a Tucson Police Detective expert in computer forensics said evidence showed Lelevier edited several video files captured in Jayden Glomb's bathroom and watched them several times.